Realty Income (O) has gone and done it again. You really have to love this company and its commitment to a rising dividend. Seriously, go check out their investor relations page after you finish reading and see how much they talk up their dividend and just how powerful it is. On Wednesday, Realty Income released their latest earnings report and announced yet another dividend increase. That's the 4th dividend raise they've given investors this year alone. 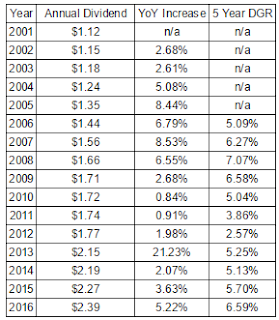 The dividend was increased to $0.2015 per share from $0.1995. That's a solid 1.0% increase. Realty Income is a Dividend Champion with a 23 year streak of growing dividends. Shares currently yield 3.46%. The 23 year streak is mighty impressive, but there's really so much more to it when you look into the history. It consists of 552 consecutive monthly dividends paid, 87 increases and 75 consecutive quarterly increases. Compared to the same payout in 2015 the dividend has increased 6.1%! Since I own 91.685 shares of Realty Income in my FI Portfolio this raise increased my forward 12-month dividends by $2.20. 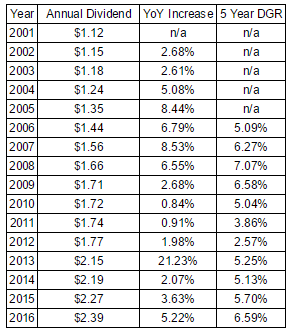 This is the 15th dividend increase I've received from Realty Income since initiating a position in mid 2013. Cumulatively my income from Realty Income has increased by 11.0%!!! According to USInflationCalculator the total rate of inflation over the same time period is just 3.5% so Realty Income has increased my income over 3 times faster than inflation has eaten away at it. I'm trying out embedding this chart so whoever reads this first let me know if it's displaying. That really is a thing of beauty. Slowly but surely the dividend keeps climbing higher. Those dividend growth rates work out well when shares are offering a starting yield of 5%+; however, over the last year Realty Income has been one of the top performers in the entire market. Unfortunately a rising share price means a declining yield which is now down to just 3.46%. As I mentioned earlier the dividend increase was announced during an earnings release and management provided updated guidance on 2016 AFFO. 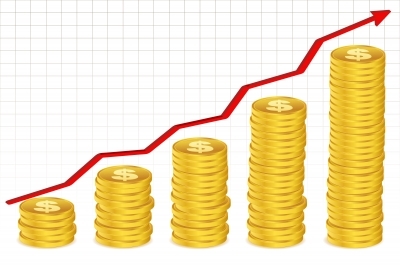 Adjusted funds from operation, AFFO, is a better representation of the actual cash moving through a REIT than earnings per share and is therefore the metric to use to determine a dividends' safety. 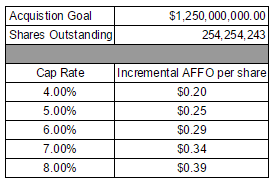 Management guided for 2016 AFFO between $2.85-2.90 which would be a solid 4-5.8% increase from 2015's numbers. Assuming the new dividend was paid each month for 2016 the dividend would be very safe with a payout ratio of 83.4-84.8%. One other thing that was mentioned in the earnings release was that management is also boosting their full year acquisition target to $1.25 B from $900 M. Typically REITs have to access the capital markets by issuing debt or secondary stock offerings to fund their growth. Given the premium valuation on the shares I fully expect acquisitions to be funded primarily from stock. I ran through some quick numbers to get an idea of the potential incremental AFFO that Realty Income could obtain with a $1.25 B acquisition target. These are very quick estimates and in reality a lot more information would be needed to estimate the acquisition impact. My forward dividends increased by $2.20 with me doing nothing. That's right, absolutely nothing to contribute to their operations. Based on my portfolio's current yield of 2.95% this raise is like I invested an extra $75 in capital. Except that I didn't! One of the companies I own just decided to send more cash my way. For a dividend growth investor there's not much that's better than hearing news of a dividend increase. So far this year I've received 31 increases from 25 companies increasing my forward 12-month dividends by $173.67. My FI Portfolio's forward-12 month dividends increased to $5,618.85 and including my higher Loyal3 portfolio's forward dividends of $64.29 brings my total taxable account forward dividends to $5,683.14. Yes like I mentioned it was just a rough estimate for potential acquisitions and until something is announced it'll be hard to forecast. There can be a big difference between whether it's 100% stock or debt financed or if it's a combination of both. If the cap rate is higher than the cost of capital then it'll be accretive. I'll side with management on their acquisition ability since they have a great track record.